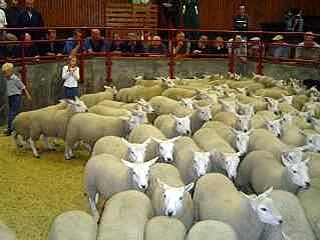 The Cumberland & Dumfriesshire Farmers Mart PLC had forward 1,066 breeding sheep at their weekly sale at Longtown on Tuesday 23rd June, 2009. Another excellent show easily maintained late rates. Top of £68 for a Texel ewe with twins from Tow Low; Jacob £50 Mossband House; Greyface £46.50 Cumstone and Tow Low, £46 Murraythwaite, £44.50 Hopestead; Hill Cheviot £40 Waterloo; Blackface £35 Drumcork. Ewes with singles to £59 for Greyface from Murraythwaite, £57.50 Cumstone; Cheviot Mule £55 Cumstone; Lleyn £48.50 Wynd; Texel £48 Tow Low; Suffolk cross £46.50 Glasson; Hill Cheviot £45 Cumstone, £40 Pennine View; Jacob £37 Waterloo; Blackface £36 Drumcork. Hoggs with singles to £57 and £55 for Greyfaces from Tow Low; Suffolk cross £56 Tow Low. Greyface hoggs with twins £44 Tow Low.